Power plants are one of the world's largest polluters, since as an industry they emit the largest amount of carbon dioxide worldwide. NewCO2Fuels can convert these carbon dioxide emissions into drop-in fuels, such as synthetic gasoline, diesel, and methanol, or produce syngas, which can be used as an energy source by the power plant. NCF systems obtain the required CO2 from the power plants' flue gases by conventional means. 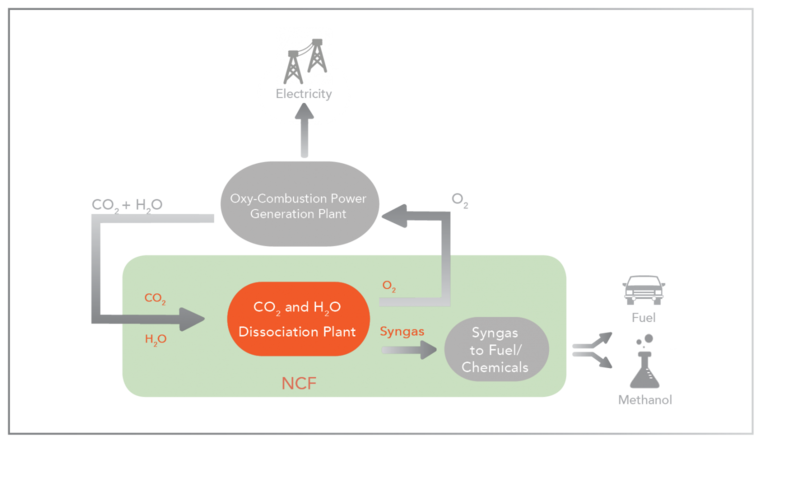 The use of NCF product can be further improved when implemented together with Oxy-Combustion power plants. In this case, the flue gas is pure CO2, hence reducing cost, while the oxygen NCF produces is fed into the combustion chamber, reducing the ASU required output and decreasing its operating cost.